Calling all Parents and Staff Join the PTO! We encourage all parents and staff to join the PTO. Our Membership fees help cover our school supply costs. Did you know that when we buy in bulk we are can purchase supplies for the whole school for about $12 a student? A representative from FCSP will be in attendance to discuss and answer your questions regarding the principal selection process that will begin soon. Please be aware of the new FCPS Principal Selection Process which has changed since last spring. You can find the new selection process at https://www.fcps.edu/careers/career-opportunities/administrative/principal-selection-process. We encourage all parents to attend this important meeting. Join us Thursday, June 8th at 5:30 p.m. for an International Potluck and to say goodbye to Mr. Butler and Mrs. Kerr, who are both leaving Mason Crest at the end of the school year. Past and present students and families are encouraged to join us. ***Prior to dinner will be a short PTO membership meeting to elect a new slate of officers for the 2017-2018 school year. ***A bus from the Parliament Apartments will be leaving at 5 p.m. to take families to Mason Crest. The PTO Meeting is followed by presentations from the school counselors, school psychologist and social worker. 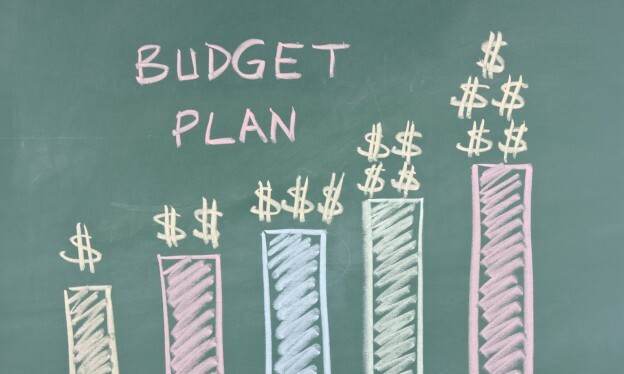 Please take a look at the proposed budget for 2015-2016 year. We will be voting to finalize the it during the PTO meeting, held on Thursday, October 27th at 6pm. To view the proposed budget click HERE. 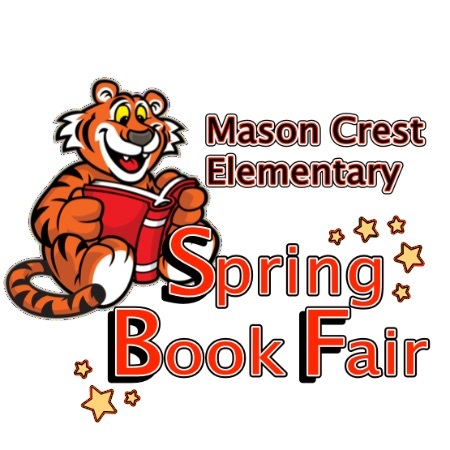 Please feel free to email Treasurer@masoncrestpto.org with questions and/or concerns regarding any of the line items. Thank you. Please visit the link below to help make this event a success! Really need help on Wednesday evening. 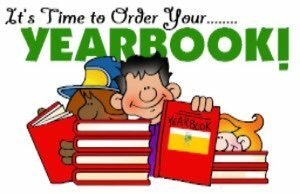 Orders are due June 1st! See Tuesday folders for more infomation! It is time to elect our PTO board of officers for the 2016-2017 school year! Please plan to attend the PTO meeting on June 9th at 6:30pm to meet the nominees and cast your vote. Folder copying: WE NEED YOU! Kindergarten summer play dates: WE NEED YOU! Green committee: WE NEED YOU! Restaurant nights: WE NEED YOU! Please review the attached red line by-laws changes. They will be discussed/approved during our next PTO meeting on June 9th at 6:30pm. 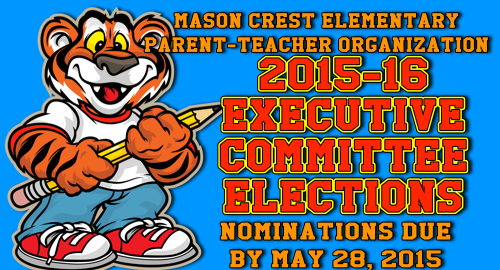 Nominations are now open for the Mason Crest PTO Executive Board for the 2015-16 school year. This is an excellent opportunity to show your Mason Crest Tiger pride and connect with other families. Any PTO member in good standing can be nominated for the position of President, Vice-President of Finance, Vice-President of Administration, Vice-President of Ways & Means, Vice-President of Communications and Vice-President of Community Outreach. 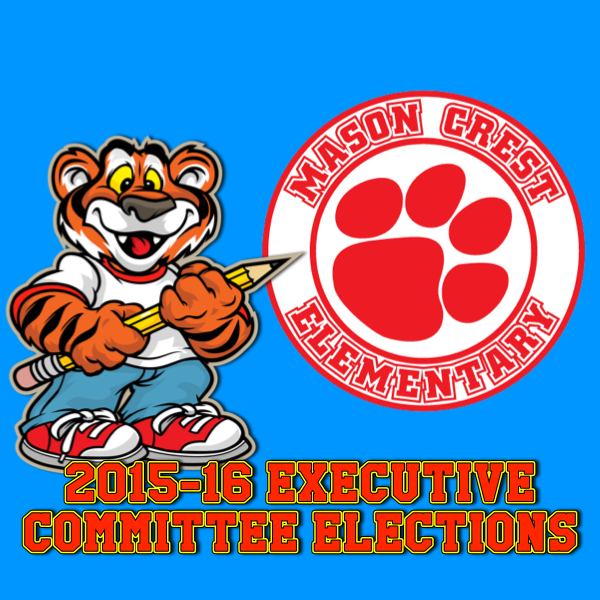 The election for all board positions will be voted on at our final PTO meeting of the year in June. If you would like to nominate yourself or someone for a position or if you have any questions about the process, please contact both of our Nominating Committee members, Crystal Krason (crystal.krason@masoncrestpto.org) and Daniela Raik (daniela.raik@masoncrestpto.org), before the May PTO meeting on May 28 at the Parliaments Apartments to be added to the the official election ballot. The President of the Mason Crest PTO manages the overall objectives and strategies of the PTO, acts as a liaison between the parents and the Mason Crest staff and organizes PTO meetings and events. The Vice-President of Finance maintains custody of all of the organization’s funds, keeps a full and accurate account of receipts and expenditures and makes disbursements. The Vice-President of Administration records the minutes of all meetings, ensures all meetings follow procedures and the rules of order and maintains the membership and historical records. The Vice-President of Ways & Means identifies and organizes the fundraising opportunities and events that will benefit the PTO mission and its primary financial needs and recruits committee members for fundraising events. The Vice-President of Communications coordinates the electronic and print communications of the organization including weekly announcements and regular newsletters, and arranges language translations and interpreters for the organizations events. The Vice-President of Community Outreach coordinates the recruitment of volunteers for the PTO, establishes family outreach, maintains a volunteer database and creates a PTO presence at all school events. Please note that the above positions can be held by two people working together. If you are interested in filling one of these positions or you know someone who you think would be great in one of these positions, please share that name with the Nomination Committee and they will contact the person to see if they are interested in serving. 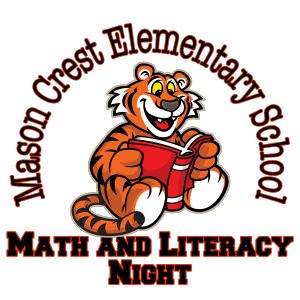 ANNANDALE, Va — Mason Crest Elementary will be hosting Math and Literacy Night on Thursday. Dec. 11. The event will begin with a free family dinner in the school’s cafeteria beginning at 5:30 pm. Afterwards, the Mason Crest staff will conduct math and literacy activities in the classrooms. Each student who attends the Math and Literacy Night will receive a free book. The students are setting goals in math and literacy at school and parents and families are encouraged to work with the student to set a goal at home as well. For each goal the student achieves, they are asked to fill out a goal sheet provided by the school and each sheet they turn in will be entered into a drawing for a change to become Principal for the Day. If the entire school turns in 500 goal sheets, all of Mason Crest will have Friday Sunday on Dec. 12. ANNANDALE, Va. — The Mason Crest PTO will hold its first general membership meeting on Sept. 18 at 6 p.m. in the Mason Crest Elementary Cafeteria. Following the meeting, members of the Mason Crest PTO will be on hand during the Mason Crest Elementary Back to School Night on Sept. 18. The Back to School Night will begin at 6:30 p.m. Members of the PTO will be present to answer questions, sign up volunteers and assist parents as they prepare for the new school year.